Now it is a well known fact that one of the things I love most about the colder months is taking long hot baths with Lush’s Autumn/Winter bath bombs, bath melts and bubble bars. More often than not I find myself indulging a wonderfully glittery bubble bar or a bath bomb that turns the water into a multicoloured spectacle in my bath. 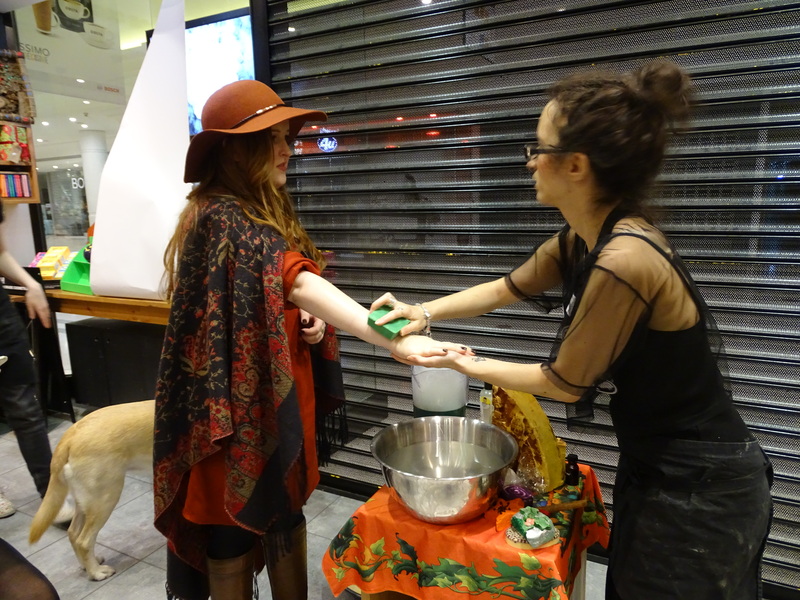 Last week I was invited to attend the Lush Bromley Winter event by the lovely staff of the Lush Bromley store. Myself, my guide dog Unity and a group of lovely local bloggers went down to Lush to check out their new Halloween and Christmas collection to talk about on our blogs and let me tell you, it didn’t fail to amaze! So today I am going to be sharing with you all some of my highlights from the collections and what you can expect to see in Lush stores this Autumn/Winter. Are you ready to get festive? 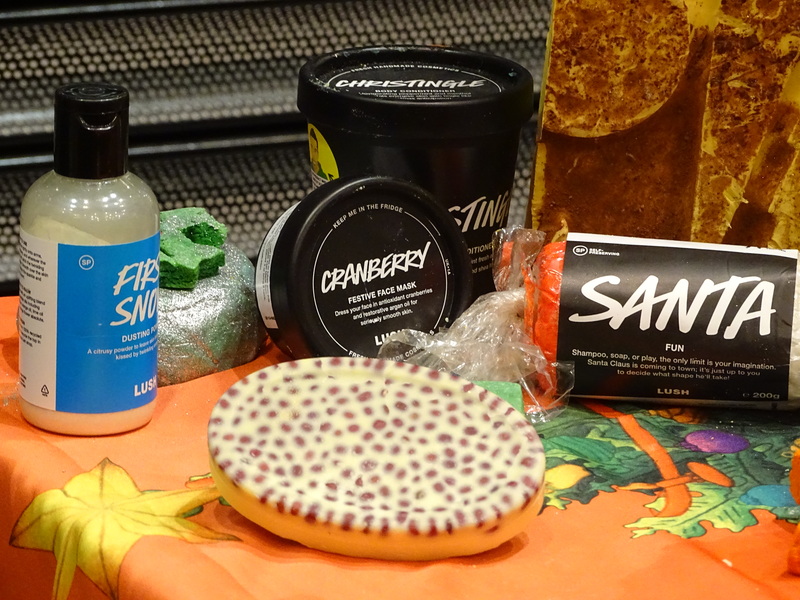 So I will begin with Lush’s new range for the upcoming spooky festivities for Halloween as well as some current products that can be used for Halloween. The first product is the Sparkly Pumpkin Bubble Bar which is a pumpkin shaped bubble bar that you crumble in the bath under running water. It is made with Juniper Berry, Grapefruit Oil and Lime Oil to give your bath an uplifting scent. The bubble bar also has bright gold glitter to add a touch of sparkle to your bath too. it’s one of my personal favourites for this time of year and as its a bubble bar you can use it more than once. The next bath product for the Halloween festivities is the Lord of Misrule Bath Bomb, inspired by the tradition of the feast of fools the bright green bath bomb is blended using Black Pepper, Fair Trade Vanilla and Patchouli to create a spicy scent. When placed in the bath it turns the water a deep blood red, so you can make like you are bathing in the blood of your slaughtered enemies….well if you have any of course. This is also available in a Shower Cream which is made with Wheatgrain Oil. Another highlight that I loved from the new Halloween range is the Nightwing Shower Jelly. Now to give you a bit of background about these products if you are not familiar with them, Lush do a range of Shower Jellies that come in pots. You rub the jelly over you skin until a foam appears on your skin. I have been a fan of these for a long while and the new Halloween edition is truly amazing. It is scene with fresh Lime Oil and Carrageen Extract to create an uplifting blend for cold nights. The best thing about it is that is in the shape…..wait for it….of a bat! One product that was featured during the bloggers evening was Halloween gift set called The Jeebie-Jeebie Bat containing the Nightwing Shower Jelly and the Lord of Misrule Shower Scream. This would be a great little gift for someone who has their birthday around Halloween or who maybe likes the Halloween festivities…Or a gift for yourself if, like me, you like spending the night in on the occasion watching spooky films and eating sweets. The set comes in an adorable package shaped like a ghoulishly grinning bat. The last things to mention for the ghoulish festivities is the range of lipsticks and eye pigments that Lush offer. In particular I am rather fond of the red pigments that lush offer for the lips, they offer some very dark red colours as well as a dark vampish purple. Perfect if you are creating a look for a Halloween party or event. But of course Lush offer some beautiful shades for the eyes to like in a deep midnight blue for a pop of colour on the lash line or a bright orange if you are going for a pumpkin inspired look. Now its time to get into the early Christmas spirit with this next part, now i know some of you may be thinking ‘but it’s only October!’ Yes but these amazing Lush products are only available until the end of December so you may well enjoy them whilst you can. Well, thats my logic anyhow. So, the way in which I will talk about these products is to pick my highlights and split them into separate categories including bath products, shower products, body products, face products and gifts. So, hopefully there will be something for everyone. The first bath product that is a firm favourite for the festive season is the Magic of Christmas reusable bubble bar. This gold star shaped bubble bar on a cinnamon stick so that it looks like a magic wand contains Almond Essential Oil, Cinnamon and Sweet Orange Oil to create a sweet and spicy blend. 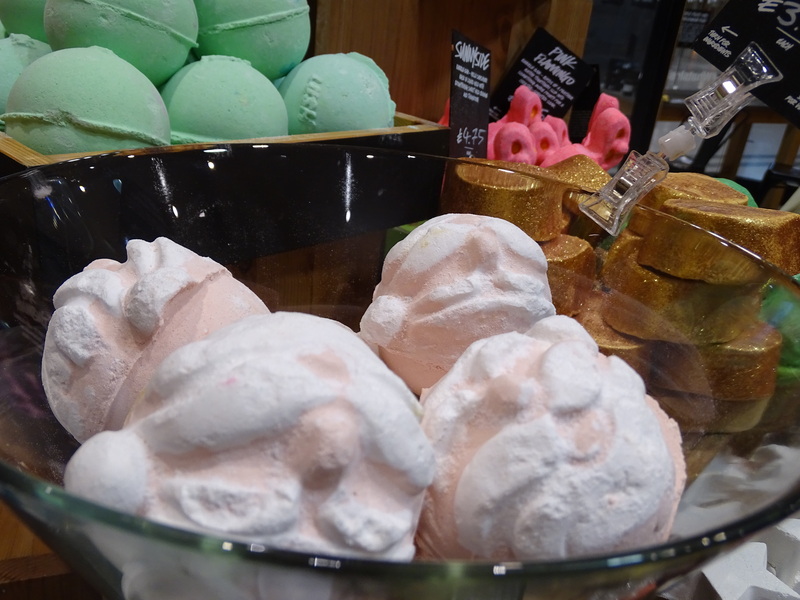 The next festive Bubble Bar is somewhat of a Lush cult classic and that is the lush Candy Mountain Bubble Bar. Which is a sweet blend made with fair trade vanilla to create a scent that mimics the smell of sweet candy. With its pin and white colour scheme this Bubble Bar is perfect for those who like a touch of sweetness to their bath and perhaps favour ones like Creamy Candy or the Comforter. The next Bubble Bar is the Holly Golightly Bubble Bar a large glitter covered, christmas pudding shaped Bubble Bar made with Clove Leaf Oil, Patchouli Oil, Persian Lime Oil and Sweet Orange Oil. It is a rather large Bubble Bar and turns the water a deep shade of Holly green, perfect for the people who like the scent of Christmas. Because this very much smells like Christmas in a Bubble Bar with its spice, citrusy blend. The next one is without a doubt the cutest one that Lush offer and that is the Peeping Santa Bubble Bar. Lush are renown for having a cute little whimsical bath bomb or bubble bar with eyes and a face and this year Santa has made an appearance. This red and white bubble bar fashioned to look like Santa with his red hat, body and chocolate button eyes is a great one for those who like the cuter side of Lush’s Christmas range. Made with Geranium Oil, Bergamot Oil and Olibanum Oil to create a fresh, clean scent. The next one is a new addition to the Lush Christmas range, the Yog Nog Bath Bomb is a warm blend of Clove Bud Oil, Shea Butter and Soya Milk Butter to condition the skin and soothing Ylang Ylang. They also offer this is a soap form which I used in the previous year, but the bath bomb would be great for anyone going to a party or who needs to give their skin a moisture boost. Cinders is one of my all time favourite Bath Bombs, its inspired by the legendary story of Cinderella as she sits by the dying embers of the fire before she is married to the Prince. The orange and yellow bath bomb contains Almond Essential Oil, Cinnamon Leaf Oil and Sweet Orange Oil to give it a warm spicy scent. It also contains popping candy to create the sound of a crackling fire, which is great if like me you have limited vision and love the world of sound. It is my Autumn bath time essential! The Butterbear Bath Bomb is a great one for those of you who like something simple, fresh and very moisturising at bath time. It is made with Fair Trade Cocoa Butter and Ylang Ylang to soften the skin and calm the spirits. When you place the bear shaped Bath Bomb into the water it fizzes up and turns the water a pale milky colour. Not one of Lush’s most aesthetically pleasing bath bombs, but it works wonders for the skin. The next bath product is the Star Dust Bath Bomb, a white star shaped Bath Bomb made with Fair Trade Vanilla Absolute, Rosewood Oil and Bergamot Oil. The special thing abut this Bath Bomb i that when you add it to your bath it turns the water a pale blue with tiny little stars in it. The Snow Angel Bath Melt is a calming blend Rose Absolute, Benzoin, Cassie and Fair Trade Cocoa Butterer. It is also one of the glitter covered editions of Lush’s Christmas range and it is the quintessential Bath Melt to use to achieve soft skin and a touch of sparkle for a Christmas party. The Salt and Peppermint Bark Body Scrub is an invigorating solid body scrub with fresh peppermint to cleanse and renew the skin. Its perfect for those early mornings and when you need to brighten up those cold Winter days. This early dusting powder made with Sweet Orange and Lime Oil is perfect to use to get a touch of sparkle to your skin for a party. Use it after a body moisturiser like the Celebrate body lotion. Its a very uplifting scent and great for those upcoming festivities. I utterly fell in love with this new festive addition to lush’s Fresh Face Mask Collection. One of the things aside from bath bombs that Lush renowned for is there amazing collection of face masks using fresh and natural ingredients for different skin types. In previous years I have used the Oatifix and Cupcake face masks and now I thought I’d try out a new addition. This face mask is packed with ingredients to protect, soothe and moisturise the skin. It contains anti-oxidising Cranberries, nourishing Argan Oil and cleansing Fennel. Just remember to keep this in the Fridge between uses and use it within 28 days of purchasing . Now we move onto the gifts territory .. There are many sets to choose from at different price points, with different products to suit everyone. I will personally pick some of my top sets, but there are plenty more in Lush stores and on the website. This is a fantastic one for anyone who loves a multi sensory experience, as the box itself is a wind up music box depicting a cartoon storyboard of the butterbear character building a snowman. Inside you get the Magic Wand Reusable Bubble Bar, a Butterbear Bath Bomb, a Peeping Santa Bubble Bar, A Star Dust Bath Bomb, a Golden Wonder Bath Bomb and a Snowman Fun. This set retails at £34.99. This next one is great for anyone who is on a budget or who is perhaps looking for a Secret Santa gift and how appropriate it would be seeing as it does stick with the Santa. It is a circle shaped gift box depicting Santa’s round belly. Inside you get the Santa’s Belly shower jelly and I think this is paying homage to the famous poem T’was the Night Before Christmas with the words ‘He had a broad face and a little round belly. Which shook when he laughed like a bowl full of jelly.’ However, I digress with my literary comments, you also get a Red fun which is a product that you can mould into any shape and use in the bath, as soap, shampoo and so on. So this would be a great gift for snooze on their travels for Christmas. This gift is one I would personally recommend for those of you who are a bit unsure of what fragrance a person would like or if they do not like the glittery, colourful bath products. This green and red tin patterned with the Butterbear design contains six Butterbear Bath Bombs. Butterbear is a very soft gentle scent with calming Ylang Ylang and moisturising Cocoa Butter. They are intensely nourishing to the skin, perfect for anyone with dry skin. This gift retails at £14.95. This next set is a little bit more on the pricey side, but you do get a lot inside the box of wonders. The box is a large rectangular shaped box with a green box and a pink, red and green floral pint on it. It resembles a large chocolate box and I designed as a Romantic gesture. Of course it doesn’t have to be from a significant other half or admirer. Inside you get a whole host of festive and non festive goodies such as The Comforter Shower Cream, Creamy Candy Bubble Bar, So White Bath Bomb, Five Gold Rings Bubble Bar, Snow Fairy Shower Gel, Luxury Lush Pud Bath Bomb, Tender in the Night Massage Bar and lots more. This set retails at £79.85. I also did a Lush Haul over on my YouTube channel which you can find below. Don’t forget to check out the other amazing bloggers who also went to the event via the links below. 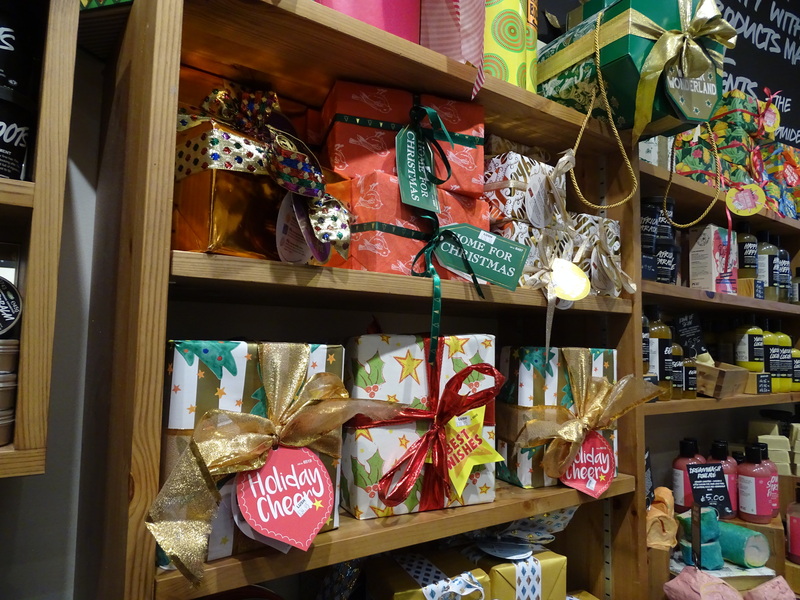 Thank you so much to Lush Bromley for inviting me to the event, to the other bloggers for kindly linking me in their blogs and to all of you for reading! Comment below with your favourite Lush Winter product and why. Hello mates, its wonderful post concerning teachingand entirely defined, keep it up all the time.